On behalf of the officers and members of Queen City Lodge No. 761, Free and Accepted Masons of Tennessee, we welcome you to our masonic website. The purpose of this website is threefold. First, it is designed to share our lodge’s masonic activity information with our 360 plus lodge members by allowing them a place to congregate online, pass masonic information and know about this lodge and sister lodge activities. Secondly, it serves to provide useful and accurate information to assist good men interested in Freemasonry and enable them to make a concious decision about joining our Ancient Fraternity. Thirdly, and of equal importance, it is to inform the Clarksville community about Freemasonry and our ongoing charitable and benevolent efforts. As Masons, we value and promote Ethics, Personal Growth, Tolerance, Education, Diversity, Philanthropy, Family, and Community Service. We believe that there’s more to life than pleasure and money. We respect others’ opinions and strive to grow and develop as human beings. We are committed to making the world a better place. Personal growth – Our continuing pursuit of knowledge, ethics, and leadership skill makes us better men and brings more meaning to our lives. Friendship – Masonry is a community of men and their families who share your beliefs and values. A sense of belonging – The masonic fraternity lets man associate with other men of honor and integrity who believe that things like honesty, compassion, love, trust, and knowledge are important. A strong, successful brotherhood – With more than 41,000 freemasons in Tennessee, Masons can be found in any field of employment and come from all walks of life. Service to community – Charity is at the heart of most Masonic activities. Our commitment to philanthropy, volunteerism, and community service helps make the world a better place for all of us. Rich history – You will be part of a fraternal organization that values tradition and history. The traditions and core values of our fraternity are relevant today and will endure to centuries to come. Our Masonic Lodge website is dedicated to explaining the philosophy and ideals of Freemasonry, so that both old and new members are able to take part in it’s activities; become regular attendants; and better grasp the aim and purpose of the endeavors of this Ancient and Time-Honored Fraternity. 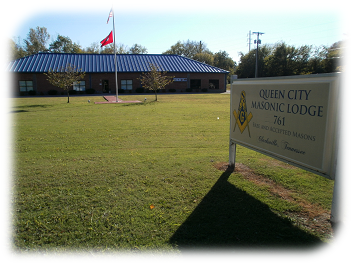 If you are a good man searching for meaning, depth, and focus to life, or searching for a philosophy and ethic that will help you to live a better life for you and your family, or searching for individual growth and self-improvement, I encourage you to learn all you can about Queen City Lodge No. 761 and Freemasonry in general and if you have additional questions to please contact us. We look forward to hearing from you.